CleanAural for dogs is a pH balanced routine ear cleaner, for the removal of moderate ear wax and debris where the ear drum is intact. CleanAural can be used alongside topical ear treatments for otitis externa. CleanAural Ear Cleaner has the added benefit of not staining or discolouring the hair around the ears and is pH adapted for delicate skin in the ear canal. It can be used alongside topical antibiotics used to treat otitis externa. 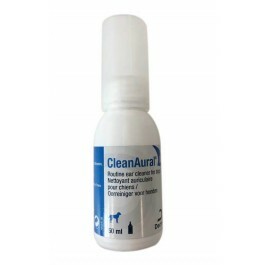 CleanAural Ear Cleaner is supplied with a soft applicator and is suitable for puppies and adult dogs. It may help to have a helper to gently restrain the dog. Place the tip of the nozzle into the opening of the ear canal. Squeeze the bottle gently to deliver a few drops of CLEANAURAL®. - Gently massage the base of the ear for a few seconds then let the dog shake his head.